Congratulations on finding the number 1 provider for driving lessons in Northampton. We have over 20 instructors serving the NN1-NN6 postcode areas. Our instructors are flexible so if you are studying in Moulton for example and need dropping off in Town/Home we can work with you. Our instructors are local to the area (we don’t sub you out like some companies) and they know all of the test routes areas such as; Queens Park, Dallington, Abington, Weston Favell, A508 dual carriageway going up to the roundabout that meets the A45 and more. We have Grade A instructors available and offer manual and automatic driving lessons in Northampton. Pupils who have recently passed with us in Northampton. Our average learner driving in Northampton took just 26 hours last year. That’s practically half the national average. Last year we produced over 20 Zero minor drivers too/perfect passes. One of our instructors Lee Parmenter racked up 7 zero minor passes on his own. driveJohnson’s driving school in Northampton specialises in helping you learn quickly with modern teaching techniques that are centred to the pupils needs! 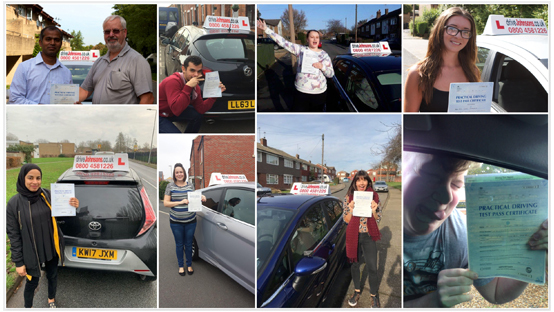 With a first time pass rate of over 90% do you really need to check out any other driving schools in Northampton? Check out our latest prices which are currently on sale. How much do driving lessons cost in Northampton? Really nice instructor, really helpful, always wants the best from each pupil. Helped me pass 1st time!! Glenn also went out of his way to pick me up from college just so I could have a lesson! I want to say a massive thank you to Amaar. You are seriously unbelievable at what you do, easily the best instructor around. You saw that I was confident on our first lesson we went on the roads. I managed to pass my test FIRST TIME and in only 12.5hrs worth of lessons. You saw that I was capable and allowed to me to book my test which I will never forget. Melvin is the best driving instructor very professional has a lot patience. Melvin makes u feel comfortable. You look foward to very lesson. I had no driving experience at all yet i passed my driving test first time and its all down to Melvin thank you. I would recommend melvin. Amaar is a great instructor and a top man. I took 25 hours of lessons and passed first time with only 2 minor faults. If you want to pass first time then Amaar is the man for the job! Previously learning to drive I knew I was an nightmare to teach to drive not only not getting along with people but being generally nervous! Having failed 2 tests and not having faith in myself! Having received lessons from Glenn he has had the time to understand the best way of my learning and how to efficiently teach me! I PASSED within 5 months of having Glenn for lessons and made me believe in what I could do! I would highly recommend Glenn to anyone for his time his patience and his belief in me to get me though! Anyone who needs to learn to drive go with Glenn! Amaar is a very patient and calm instructor. I had various lessons with a previous instructor who I felt didn't help me progress. On my first lesson with Amaar he just help me progress so quickly and helped me pass first time. He will talk about anything and make you feel at ease. 10/10 and he has taught other friends of mine that I recommended. I would like to say a huge thank you to Amaar, firstly you took me on at such short notice and you was amazing to learn with. Easy going, great to talk to, you made me feel relaxed and I enjoyed every lesson. You are always so possible and patient. I have already recommended you to my sister who you are now currently teaching and my friends. You will not find a better instructor to learn with. Cheers. I've just passed my test the first time and that's all thanks to Glenn! I suffer with really badly with anxiety as I was in a bad accident a few years ago. With the help of Glenn I managed to over come my fears! I hadn't even been in the drivers seat before I met Glenn. He was so patient with me. We had many laughs and he put me at ease, I will miss my Monday mornings with him! Brilliant instructor and overall really nice guy. Had over 30 hours driving experience with him and managed to pass my test first time with zero minors. Glenn's knowledge of roads in Northampton is incredible, taking me down any of the potential test routes I could have had and also giving me valuable driving experience around other busy roads to boost my confidence. Would thoroughly recommended Glenn to anyone wanting to learn to drive. Glenn is an absolutely and without a doubt the best driving instructor. He understands everything is different. He is supportive, patient, encouraging and fair. No matter how nervous I was, he stayed calm and helped me overcome the problems. Most of all he is a great listener and a true gentleman. I enjoyed learning ro drive thanks to him. Glenn has been extremely helpful for me and has allowed me to learn well and quickly and pass my test first time! I will/ already have recommended him to a friend! Thank you! Melvin is so far the best instructor I have met in 20yrs! He's well experienced, respectful and patient. He has postive attitude and genuinely passionate about his work. I would recommend him to all. Thank you Melvin for making me believe in myself and passing after just one attempt. Amaar has been an excellent instructor to learn with and is very open and friendly. I am so glad I was recommended to him, I had previous experience driving but he helped correct all my bad faults and was a great help in me passing my test. He didn't waste any time and each lesson was enjoyable. Thank You Amaar - I passed first time with 1 minor. Will miss our chats about football and lessons in general. Top quality guy and instructor. I can honestly say Glenn Jones has been the best instructor I have had. He's very patient, kind and makes you feel at ease when you're behind the wheel. He goes above and beyond for his students in ensuring they pass, and feeds all the knowledge you need to know about the roads and for the test. I would 100% recommend this instructor, you won't be left disappointed. Thank you so much for helping me pass first time, you were the perfect instructor as I was struggling with being nervous but you didn't lose your patience and suited the lessons to my needs. I would recommend you 100% to anyone learning to drive. What can I say about Christine?? Well she got me through my extended test with only 1 minor! She is an extremely talented instructor who certainly knows her profession. I would 100% recommended her to anyone facing the challenge of getting their licence back. Glenn was a pleasure to be taught by. Always calm and relaxed causing no pressure on me learning. Showed me great confidence when I wasn’t sure on something. Helped me the along the whole journey to ensuring I passed first time. Would like that thank him a lot and also have no complaints against him. It was honesty a great journey learning to drive with Glenn as he was constantly reassuring and gave great advice! Would highly recommend. My instructor, Glenn went over and above, even fixing my broken glasses before the test! He was clear, concise and flexible, often changing my pick up location to suit me and without complaint. Glenn was very patient and i passed second time with 0 minors.I would really recommend him. Glenn is an excellent instructor. I took lessons once a week for a year till I passed on my second time with two minor faults; Glenn always took the time to answer all of my questions remarkfully helpfully. He was always calm and considered as you want in an instructor and therefore I would highly recommend him. Lessons were relaxed and I was under no pressure to pass as well as being enjoyable. 100% recommend and with his help I passed first time with no minors! Great Instructor. Teaches you thoroughly! Managed to past my test first time with just 3 minors. Would highly recommend him to instruct you. Glenn jones was the best driving instructor by far, was always there to help no matter what the problem was, very patient and would highly recommend. Great service, friendly and knowledgeable. With all of Glenn’s help I passed first time with only 3 minors which I’m happy about so thank you! Excellent instructor, she was friendly, kind and helped me pass first time! Glenn is an excellent instructor who is always understanding, patient and helpful. I worked 40 hours each week but still managed to have a lesson without fail thanks to his flexibility. His knowledge of the Northampton roads is immense and helped me be prepared for any test route that may crop up. It was very easy to create a good relationship with Glenn, and he was completely transparent with telling me what I was doing great at and reminding me on any errors I made. I highly recommend him for any learners. Passed my driving test this morning after having lessons with Lee in Northampton. Thank you so much. Just want to stress my immense gratitude to the best instructor in Northampton - you really are. Allowed me to learn so much in such a short space of time. Really thoroughly enjoyed every lesson. From the first lesson we got on with it. Wish you all the best. When leaving the driving test centre, you may be asked to turn right onto Gladstone road and then at the next roundabout, you may be asked to follow the road to the right sign posted to Kingsthorpe. You must keep off the white hatch markings and follow the left lane all the way around the roundabout following the ahead road markings to Kingsthorpe. Should you get confused and follow the right road markings, you will go back to the driving test centre and that will be ok. You could stay in the right lane and go around again, keeping off the white hatch markings and exit the roundabout in the left ahead lane to Kingsthorpe.